No I don’t think so. For several reasons. Empathy is a process with different steps. Especially feeling what the patients feels is a quality not every doctor has. And if they do it is not always appropriate nor possible to be sensitive enough to use it. Moreover this process not only needs the quality it is also costs energy, depends on the relationship with the patient, and needs experience. Along with their education medical students loose some of their humanistic attitudes such as empathy especially during their medical clerkship, often they become more cynical during their clinical training. Empathic feelings are difficult to generate when they have no experience or when the patient is difficult to know or communicate with, while further barriers include a stressful working environment and lack of time. Empathy is somewhat beleaguered these days in an era in which “quick fixes” are encouraged by a managed care system driven by economic values. In The Netherlands we call it the DBC system. Next post on Patient Doctor Relationship Series about self disclosure Friday 25th of July. What can we clinicians teach them? Ask permission to enter the room; wait for an answer. Introduce yourself, showing ID badge. Shake hands (wear glove if needed). Sit down. Smile if appropriate. Briefly explain your role on the team. Ask the patient how he or she is feeling about being in the hospital. Teaching empathy is as argued before in this post not possible. But we can teach empathy to a cognitive level instead of an affective level. It is important to learn the students during their clerkship to conduct an interview in a way that encourages the patient to share their concerns. Instead of a disease centered interview teach them a patient centered interview. Ensure as much privacy as possible when interviewing the patient. “Break the ice” by expressing sustained respect and interest throughout the interview, e.g., maintain eye contact and a body posture slightly bent forward. Listen carefully to the patient’s account of her history and do not interrupt her for at least two minutes. Encourage the patient’s spontaneous narrative by nodding and permit the patient to take control of the interview. Watch for indirect verbal and nonverbal clues of the patient’s feelings. Respond with an accurate and explicit acknowledgment of the patient’s emotions, distress, and concerns. Encourage the patient to talk not only about his symptoms, but also about his personal and family situation, preferences, and feelings. Of all your problems, which is the one that worries you most? Do you have any preferences or suggestions about what your management should be? Do you have any ideas regarding what caused your illness? How does all this make you feel? How did you/your family feel when you were told about your illness? Encourage the patient to ask questions about his disease and his main concern(s) by asking Do you have any questions regarding your condition? This last list is from a article published in Academic Medicine. I like the comparison with acting. Real empathy is comparable to deep acting, engage in emotional labor, generating empathy consistent emotional and cognitive reactions before and during empathic interactions with the patient. (Deep acting is comparable to the method-acting tradition used by some stage and screen actors). What can be learned by all medical students is surface acting or forging empathic behaviors toward the patient, absent of consistent emotional and cognitive reactions, or both. Although deep acting is preferred, physicians may rely on surface acting when immediate emotional and cognitive understanding of patients is impossible. What do you think about empathy and doctors, can it be learned? Am I being to pessimistic? Benbassat, J., Baumal, R. (2004). What Is Empathy, and How Can It Be Promoted during Clinical Clerkships?. Academic Medicine, 79(9), 832-839. You’re right. It can’t be taught but that doesn’t mean they should stop trying. We just need to change the method. We all know (because they keep telling us in pre-clin) that we should be empathetic but if you want people to put it into practice, then there needs to be an incentive. The internists and psychiatrists at my school figured this out. If you don’t ask the patient how they feel about the disease or what their plans are for the future, you lose marks on your exam. In some OSCE cases it can be so heavily weighed that you can get the diagnosis and the treatment right but still fail the station because you didn’t find out if the patient had any questions about their disease. Now, I’m sure most of us are only going through the motions for the grade but it becomes a habit. At least until we move to the next rotation and the surgeons start ridiculing us for taking forever with our history. This leads to the second issue: People should practice what they preach. For all their pronouncements, very few of my teachers were empathetic. They have to remember that we’re basically apprentices and we’re going to do what we saw them do. Good or bad. There should be attention to this in CME courses as well as in Med School. 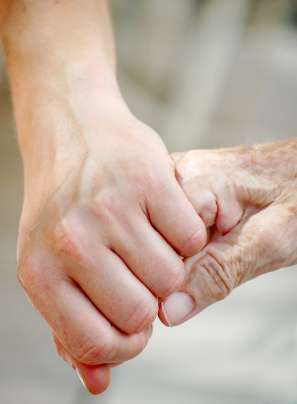 You’ve touched on a topic near and dear to my heart, as I blog exclusively about the patient-caregiver relationship at http://blog.healthtalk.com/bedside-manner/schwartz-center. I agree that teaching good communication skills is a critical part of helping physicians interact more empathetically with patients. But I also think that an important part of staying present with patients is staving off burnout, by maintaining the emotional space to keep caring about your patients day in and day out. In the United States, the nonprofit I head up, The Kenneth B. Schwartz Center, sponsors what are called Schwartz Center Rounds at 140 hospitals around the country. Unlike regular Rounds, Schwartz Center Rounds focus on cases that were tough for psychosocial reasons, not clinical ones. At Rounds sessions, caregivers might talk about the difficulty of delivering devastating news to a young cancer patient; what to do when a patients’ religious beliefs conflict with medical advice; or how caregivers cope with a hostile family. Rounds make caregivers examine their prejudices, their feelings of loss when patients die, their frustration with “difficult” patients, their communication styles, their beliefs about spirituality and religion and so much more. They’re a unique venue for airing the complicated feelings that patient care often engenders and ultimately that translates into better relationships with patients. Indeed empathy takes a lot of energy. Another important topic is to take care not only for your patients but also for yourself. A lot of machoism leads to early burn out or less with also consequences for patient care. If you can’t take good care of yourself how can you take care of others. How do you get doctors to co-operate in your valuable work? Most of them haven’t got the time as they proclaim, some of them think talking about these feelings with a “stranger” is difficult, “they don’t understand us”. It seems like there’d also be some selection bias in that the ones who would participate are probably not the ones that should participate. It’s not a bad idea though. Empathy is taught from birth! Loss of empathy occurs during medical school because that is the predominant example the students are exposed to. A fundamental step in practicing empathy would include vocabulary selection. Physicans can be very quick to remove any hope from a scenario based on the scientific data available. However, the disease process is individual. How a patient faces his disease has a huge impact on their healing. Discussing their condition using words that help to empower them or that leave them with a sense of some control over their condition can only help. For many patients, the selection of words the physician may use can become a self fulfilling prophecy. Think before you speak. If you have to close a door at least prop open a window for them.